Cape Town - As South African rugby braces for the Rassie Erasmus era next year, there is still no clarity on exactly what the Bok management team will look. Erasmus will serve as Director of Rugby and he has Jacques Nienaber back on board as a defence coach, but other than that it is still a little murky. Allister Coetzee will on Saturday take charge of what is likely to be his last Test at the helm of the Boks against Wales in Cardiff, and Sport24 published a story this week that heavily linked current Kings coach Deon Davids to the Bok job. While there may be a new head coach appointed, whoever that is will serve as Erasmus's No 2. Erasmus will be the man in charge, and he will then form his own management team underneath him. 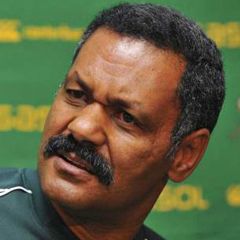 Now, the latest name to be linked with a return to Bok fold is that of former coach Peter de Villiers. According to a report published in Saturday's Weekend Argus, De Villiers could be making a return to the Bok management team under Erasmus from next year. De Villiers has not had a major job in rugby since he coached the Springboks at the 2011 World Cup. Another name mentioned in the report as a possible member of the new-look coaching panel is that of Mzwandile Stick, who started the Coetzee era as Bok backline coach but was binned last year. Davids, currently coach of the Kings, is also linked to the management team in the report.